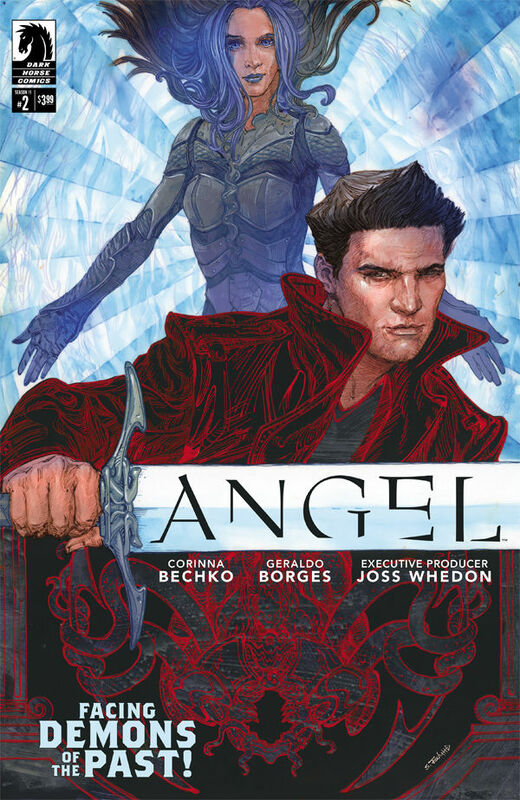 The Fellowship was fortunate enough to obtain a copy of ANGEL SEASON 11 #2 from Dark Horse Comics. The story is by Corinna Bechko, with art by Geraldo Borges, colors by Michelle Madsen, and letters by Richard Starkings and Comicraft’s Jimmy Betancourt. The Executive Producer is Joss Whedon. I have to admit that I strayed away from the Buffy/Angel books for a while, so obviously I’m behind. The SEASON 11 offers me a chance to get back in. I’m so grateful to see Fred back in some capacity, not just a shell for Illyria. Corinna Bechko crafted a script worthy of the television series. I like the switch that the intention was to dive into Angel’s past, but actually our heroes are dealing with an issue with Illyria’s past. Not familiar with Geraldo Borges’ work, but like what I see here. I was impressed on how he visualized Illyria’s true form. The MVP here is Michelle Madsen; loved the beautiful color scheme she used. Overall it’s a good book that should please the fans, but not detract lapse or new readers. ANGEL SEASON 11 #2 is in stores now or available at www.Darkhorse.com.